Fighting in confined quarters is just one of the special aspects of Krav Maga and other combat systems that distinguish it from your local karate or Taekwondo school. Nothing exists in a vacuum. And yet, the vast majority of martial arts schools I have been to train as if that in fact was the case. They learn techniques without taking any outside factors into account. It is as if you can chose the time and place to be attacked and it will exactly match the way you trained at your local karate school. If you are training for sports or competition, than in fact – that is the case; your tournament setting will exactly match your training setting. However, if you are training for personal survival, you had better rethink your training. The sad and cruel truth is you can be attacked anywhere. You can be attacked on the stairway, which completely eliminates all your fancy kicking techniques. You can be attacked in the snow by a guy wearing a heavy snow suit, which completely eliminates your jujitsu wrist locks. You can be attacked on a small boat, in an elevator, in the bathroom, on the beach, in the mud. None of this will be at all similar to the training you did at your karate or judo school. In order to defend yourself you need to get real. Krav Maga expert Itay Gil addresses all these issues, and he should know, he has 'been there, done that'. In the Jerusalem training center he has a structure set up like a house or an apartment. Some areas are too small for kicks, some areas have blind spots. Suddenly you wake up to a whole new approach to self defense. Unlike traditional kata or point sparring, you can not know in advance what will happen, you just have to train and gain experience. Some of the things we do, for example; if someone is facing you with a fire-arm and you are in a confined space; you should slam their gun hand hard against the wall, breaking their knuckles and fingers. You follow up with elbows and knees. 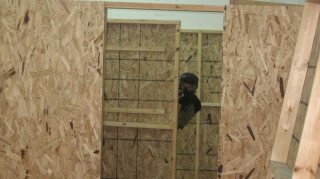 We train for situations where you have your back against the wall and are being attacked with a knife, gun or stick. 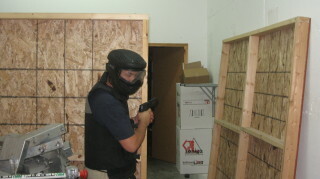 We cover all these situations in our advanced seminars for martial arts experts and law enforcement.